We all brush our teeth repeatedly every day but the matter is how properly we are able to brush our teeth. The problem with the old styled brush is that it’s hard to reach some corners of our teeth that we miss out in our everyday routine, it creates the problem in your teeth in long run. if you are cared about your teeth and searching for a more easy alternative to the normal tooth brush, here we are with the solution. Flashing your beautiful and confident smile to everyone will not be just a dream anymore with our sonic toothbrush! This sonic toothbrush delivers 40,000 brush strokes per minute, high frequency vibrations whip up the toothpaste into fighting bubbles, removing stains and plaque along gum line. The special design is more conforming to the contours of each teeth, providing more surface contact and remove more plaque, delivering gentle yet powerful cleaning. 3. Ideal electric toothbrush to bring in your long travel! 1) Portable and compact travel case included. 2) Fast recharging-only takes 4 hours to be fully recharged. And one full charge supports at least 30 days use (twice a day). 3) Convenient and easy to recharge. Compatible with any device with USB port. 1) White-Strongest, removes stubborn plaque and stain strongly. 2) Clean-Medium, for normal teeth cleaning daily. 3) Sensitive-Gentle, provides gentler motion for sensitive gums and teeth. 4) Polish for teeth polishing. 5) Massage-Massaging gums, for improving gums circulation and health. Every pack includes 3 brush heads with distinguishable color ring. You can share the handle with your family now. 6. 2-Min Timer encourages you to form a dentist recommended brushing habit. 7. IPX 7 waterproof rate. Every customer enjoys 1 year warranty and 180 days no hassle refund for every item in our store. If you are not pleased with your purchase with us, contact us at any time and our customer service team will offer prompt and satisfactory service. AN IDEAL AND PERFECT ELECTRIC TOOTHBRUSH IN YOUR TRAVEL OR BUSINESS TRIP. 1) A travel case that’s made of BPA FREE material is included, keeping your toothbrush clean and hygienic. And it’s compact and convenient to bring with. 2) USB charging support global voltage 100-240V. Any device with usb port is compatible. 3) 4 hours fast charging and 30 days long battery life, release you from frequent charging. Now you can travel the world without worrying out of battery in at least 30 days. ELECTRIC TOOTHBRUSH LET YOU FEEL LIKE A DENTIST CLEANING DAILY. 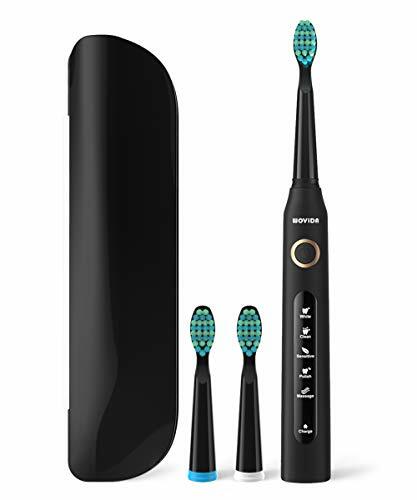 This rechargeable toothbrush delivers 40,000 brush strokes per minute to drive fluids deep between teeth and gum line, removes more plaque and tea, coffee, red wine stains. You will achieve whiter, cleaner and healthier teeth in just 2 weeks. It will also help to prevent gum disease and inflammation. Backed by warranty and 180 days no hassle refund. You can buy without worry. CONTOUR FIT BRISTLES PROVIDE GOOD TOOTH COVERAGE AND GOOD CLEANING. Small brush head can reach deep in back of your mouth, cleaning more plaque from hard-to-reach area. 3 brush heads are included, all have distinguishable color ring. You can share this toothbrush unit with your family member. Made of high quality material. Though the bristles are durable, change the brush head every 3 month will be the best for your oral health, which is recommended by dentists. 5 DIFFERENT MODES OFFER YOU A MORE PERSONALIZED BRUSHING. Several optional modes are suitable for parents, kids and children over 8 to choose one. You can personalize your clean and achieve your brushing goals by choosing one of the modes-White, Clean, Sensitive, Polish and Massage. You can find the mode that’s most comfortable for you. 2 TIMERS KEEP YOU ON TRACK AND COMPLETE THE RECOMMENDED BRUSHING TIME. With 2-minute timer, you can brush the recommended two minutes, and with 30-second reminder, you won’t miss any of your teeth. The whole unit is waterproof, so you can enjoy brushing in shower.